‘A van has crashed into a 16th century cottage in Bedfordshire, smashing through its front door and becoming lodged in the wall. The driver, a 34-year-old man, has been arrested and is suspected of being under the influence of alcohol or drugs. (The lady) told the BBC she heard a noise “like an earthquake” when the van smashed into her property. “This van came flying over a hedge and crashed into our hall and kitchen,” she said. What the news didn’t cover was that their two Airedale Terriers were there also. Afterwards there was panic and shouting: there were fire engines, sirens, flashing blue lights, police and fire crew. The driver was apprehended. Only the van was holding up the front of the house. Dogs Clem and Rupert had been put out of the way in the back garden in the dark. When the daughter came to take them away to her own house, she found them cowering and shaking. To get to her car the two terrified dogs had to be walked through all this. Can a dog be psychic? A very strange thing happened that evening, beginning a couple of hours before the huge shock crash. 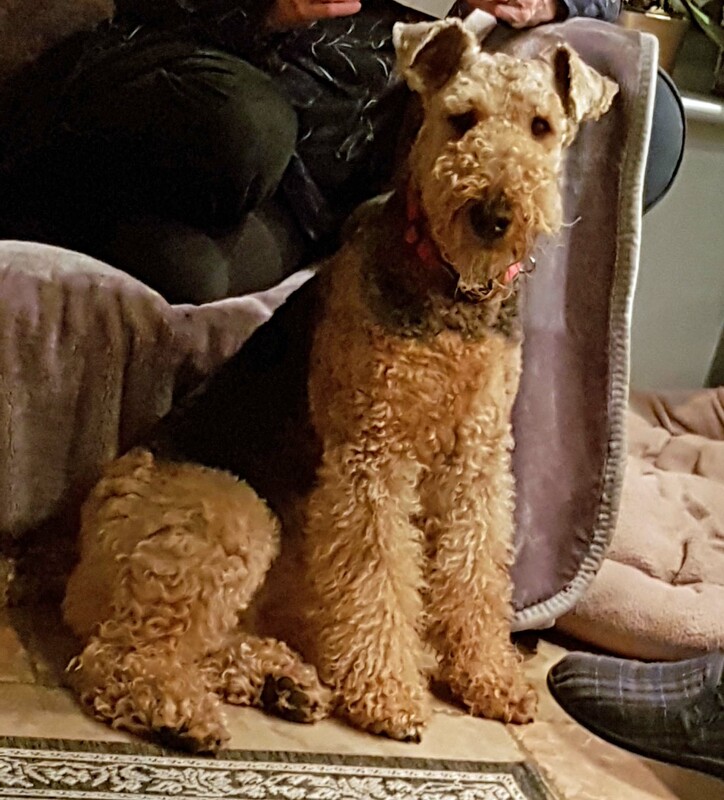 Older Airedale Rupert, usually quiet and calm, stood staring at the couple, barking repeatedly at them. Rupert had never behaved in this way before. The house was propped up, tidied up as far as possible and the dogs were brought home a week later. Clem hasn’t been herself since. Placid Rupert now continues to stare at them in an evening, barking. I met the two gorgeous dogs a couple of days ago, less than two weeks later. Rupert, more self-contained, took himself off having had a good sniff of me. Clem is the more needy. She was agitated in a friendly way and she wanted attention. Already a sensitive dog, the recent events have caused her the most trauma. She undoubtedly doesn’t feel safe. This is a brief taster of what it must be like for dogs in natural disasters like hurricanes and earthquakes, or dogs in war zones. Something sudden happens that they don’t understand and their world goes mad. A couple of days after the two dogs were back home a picture, all by itself, fell crashing down from the wall. The wall must have been shaken. Fresh panic for Clem in particular. She is very receptive to the emotions and behaviour of her humans and the upset following the event has really affected the lady and the gentleman. Picking up on this will be adding to Clem’s inability to calm down at certain times. She always has had a habit of leaping up and ‘biting’ arms when over-excited or aroused. Now that her stress levels are so high it’s happening even more. It really hurts. The lady cries out and there is shouting. Consequently Clem gets even more worked up. When I was there we concentrated on showing her that jumping up at or on me didn’t work, got her no attention, but feet on the floor did. She was very persistent but she was also a very fast learner. In no time she was choosing to sit or stand calmly instead. Knowing how this kind of dog can be strongly influenced by my own behaviour, I spoke quietly and really engaged with her. I gave her things to chew. Chewing helped her enormously. The lady said she’d not seen Clem happy like this since ‘it’ had happened. Our sensitive dogs mirror us. Behaving quietly and calmly around Clem will make a huge difference over time. The couple’s nerves are understandably still very much on edge with the shock. Their lovely cottage is the product of years of hard work. The number one priority for now where Clem is concerned is to do all they can to reduce her stress levels, very importantly by being quiet and calm around her. Any stress is cumulative and can last for days (for both humans and dogs). The stress of a shock like this will last far longer. Working on stress-reduction by doing several small things which may not make a big difference individually should produce results when added together. Dogs can get PTSD too. 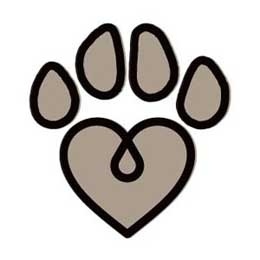 Some symptoms of PTSD in dogs are listed in vetinfo.com. I’m sure they will all get themselves back to normal before too long and, with luck and with work, Clem may actually end up more calm and confident than she was before the incident. Her humans will now act differently at those times when she can’t control herself, most particularly when they come down in the morning, come in from having been out and before meals. Instead of entering the room to jumping and arm-grabbing from a hyper Clem with poor Rupert trying to intervene, they will now have a gate in the doorway. They won’t open the gate until Clem’s feet are on the floor and she has calmed down a bit. They can then help her out by giving her something to chew as they step through. Human noise, crying out, shouting at her to stop and so on, can only intensify the dog’s arousal. (Bonfire night and fireworks in a few days’ time may well be the very last thing Clem needs just now).